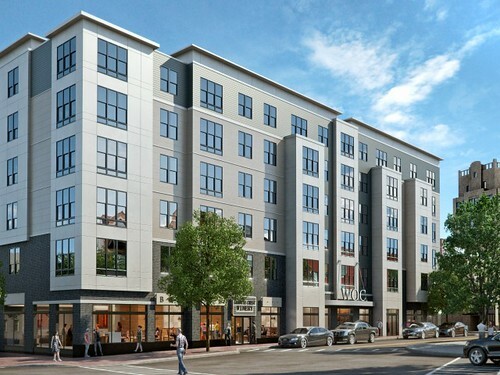 169 luxurious residential apartments now leasing in Quincy Center located steps to the MBTA Red Line. Ground-floor retail tenants include Cafe Gelato, Fuji at West of Chestnut, KKatie's Burger Bar, Orangetheory Fitness and Shaking Crab. Apartments at West of Chestnut range from studios to two-bedrooms with rents ranging from $1,825/month for studios to $2,850/month for two-bedrooms; visit WOCquincy.com for apartment leasing information. 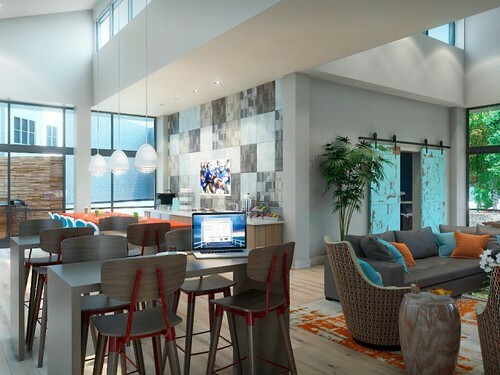 Resident amenities include a club suite, an exterior courtyard featuring an outdoor kitchen, grilling stations and lounge furniture, a media lounge, a billiards lounge, a business center, a fitness center and an on-site concierge. Garaged vehicle parking and bicycle storage are both available on site. Renowned local Pan-Asian restaurant organization JP Fuji Group’s new Fuji at WoC flagship Japanese restaurant opens Monday (1/9) night at 5 PM at Quincy Center’s new West of Chestnut luxury apartment development. JP Fuji has relocated its’ successful flagship Fuji 1546 Japanese restaurant, which opened in 2004 in Quincy Center, to the newly built West of Chestnut space just down the street. Fuji at WoC will be JP Fuji’s largest restaurant and will include amenities such as a private tasting kitchen, a spacious dining room and an enclosed outdoor patio. JP Fuji, which operates 11 Boston area restaurants, was named 2016 Small Business of the Year by the Greater Boston Chamber of Commerce. Fuji at WoC follows JP Fuji’s recent opening of Fuji at Ink Block, an upscale restaurant concept located at the Ink Block development in Boston’s South End. 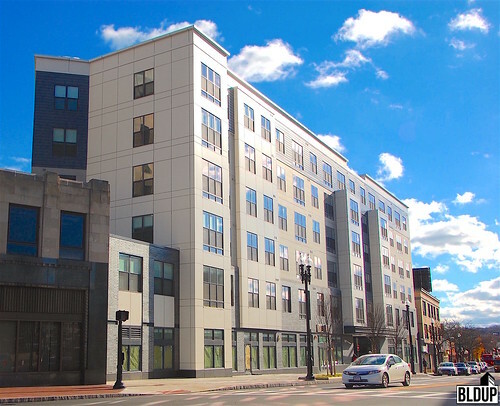 The second building at West of Chestnut opened to residents today (September 1st, 2016), signaling the completion of the new-construction luxury apartment development located in the heart of Quincy Center steps to the MBTA Red Line. The first building opened in May. West of Chestnut features 169 units ranging from studios to two-bedrooms now leasing; visit WOCquincy.com for apartment leasing information. Curbed Boston reports that West of Chestnut is 58% leased, with tenants coming from "triple deckers in South Boston and from older apartments on Beacon Hill.” West of Chestnut features multiple amenities including a club suite, an exterior courtyard featuring an outdoor kitchen, grilling stations and lounge furniture and a billiards lounge. Ground-floor retail tenants include restaurants Fuji at West of Chestnut and KKatie’s Burger Bar as well as Orangetheory Fitness. Both of West of Chestnut's buildings have now topped off, and the project's 169 residential units are now leasing. Installation of finishes is nearly complete on the building fronting Hancock Street, expected to open in spring 2016. 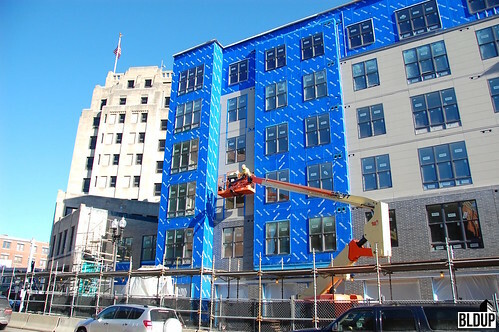 Windows are nearly fully installed on the building fronting Chestnut Street, expected to open by fall 2016. Construction is progressing at West of Chestnut in Quincy Center. Frames are rising for both six-story buildings. The building fronting Hancock Street is close to topping off! Check out our recent site photos. Initial site preparations are underway at West of Chestnut for construction of two six-story residential buildings.